Although many would assume the best haunted house in Massachusetts would be located in Salem, they’re wrong. Based on my late 90’s visit, Barrett’s Haunted Mansion in Abington deserves the title. Why? Simply put, Barrett’s goes above and beyond the call of duty in all aspects of operating a haunted house. Let’s start with something that can be neglected in haunted attractions: Line entertainment. When visiting a popular haunted attractions (house, hayride, etc), there’s bound to be a lot of people who want to go through. This leads to long lines and waiting times, which can get really boring really fast. In order to make the waits more tolerable, Barrett’s provides outdoor displays (I loved the skeletons in a rowboat) and “monsters” who terrorize those waiting in line. For 2008, they’ve added a separate attraction that simulates what it’s like to be buried alive in a coffin. 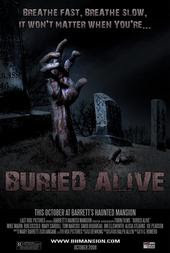 If it’s anything like the “buried alive” simulator described here, it’ll also provide entertainment for people waiting in line as well. UPDATE: This attraction has since been discontinued at the mansion. The mansion itself is absolutely amazing. They set up a realistic zombie-infested swamp, complete with a shaky bridge, running water, and a shack owned by a deranged redneck…INDOORS. The talented staff and high-quality props will constantly leave you guessing whether or not they’re people in costumes waiting to scare you or just inanimate objects. More often than not, you’ll guess incorrectly. This is not to say that all the “monsters” just leap out at you or stand still and suddenly come to life, though. The rooms all look great and several of them used creative methods of entering and exiting them. They also offered a great twist on the mirror maze concept that has to be seen in order to be fully appreciated. Also worthy of note are the expert use of lighting effects. Not only do they provide an appropriately dreary atmosphere, but they were also used to enhance certain scares. I especially liked the twist they put on the standard “dark maze”-style room. Plus they even give you candy when you exit the haunt. What’s not to love? Barrett’s Haunted Mansion changes the rooms every year, although my casual research on the matter seems to indicate that select rooms reappear every year or so. So while I can’t be sure that you’ll have the exact same experience that I had if you visit, but I can be sure that you’ll have a great time. I’d imagine that some of you are balking at the ticket price, but trust me, it’s worth every penny. Besides, you can knock five dollars off the price of a ticket if you use this coupon (Only good Sunday through Thursday; discount doesn’t apply to the “Buried Alive” attraction). Special thanks to Barrett’s Haunted Mansion for use of the picture.